Making children do their homework is never an easy task, but over the summer it can be even more difficult. It's not just that children have a million other things they would like to do; it's also the fact that they have no real exams or deadlines, so no real impetus to get any revising done whatsoever. However, doing at least a bit of homework over the summer is important. No parent wants their child to forget what they have learned during the academic year, nor is it advisable to get them out of the habit of reading or putting pen to paper. You might think this is important for only older kids, but even younger ones can benefit from a steadfast routine. Don't forget that making homework fun is important. If your children dread the tasks you assign them, not only will you be facing a losing battle but in the long run it will backfire on their future learning. Keep them interested, and the learning gets a lot easier for you and for them! Doing a little bit every day is key. Let your children know from the first day of the summer that they will be required to do a bit of homework, but don't make it too taxing. Some kids might work best in the mornings, others in the afternoon. Sit down and decide what's best for your family. Don't forget that every child is different, and that they all learn in different ways and at different rates. Your daughter might enjoy doing a half-hour of math every morning for the first week, then a half-hour of spelling every morning. You son might prefer 15 minutes of maths followed by 15 minutes of spelling in the same day. Let them be your guide, but be firm but fair. If they balk initially don't back off completely, but don't pressurise them too much. Work up to regular homework times gradually and let them know it's meant to be both educational and fun. And when they do a good job, reward them. Everyone likes to feel their efforts are appreciated, especially children. 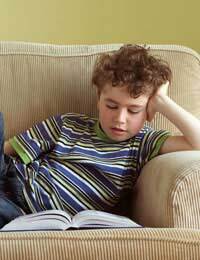 Depending on the age of your own kids, you might want to make homework charts or set up a system of rewards. For example, every day they do their homework without complaining they receive a marble, and when they get five they can trade them in for a specific treat or outing. Outings can be anything from a trip to the cinema or playground, or having a friend round to tea. Older kids can save up marbles to purchase a specific item, such as a Nintendo game or t-shirt they've had their eye on, or the latest CD. Whatever material rewards you give your children, don't forget that in the long run the most important reward they can get from their parents is plenty of praise. Show them you appreciate the work they do and let them know they're doing it for themselves as well. Take an interest in their efforts and don't forget that constructive criticism is important too. Homework doesn't always have to mean square route memorisation or learning tables of difficult-to-remember facts. It can mean writing a short report after a fun trip to the museum, designing a series of drawings following a visit to an art gallery, or going on a nature walk. Here are some ideas to make learning fun – your children won't even realise that they're actually doing homework at all! Start a Bug Museum and have your children write short journal entries about each bug they catch. They can include information about the insect's habitat, habits, diet etc. Have your child pretend to be a reporter and interview key figures in your summer lives – a neighbour, a best friend, the playgroup leader, the postman. They can present their series of interviews to an audience of parents/grandparents. Serve refreshments. Encourage summer reading by preparing short question-and-answer worksheets and having your children write a short book report for every book they read (even short picture books for small children). They can include their own drawings and even decorate the Report Book with stickers, glitter and other fun cut-outs. Keep a scrapbook or journal. Have your kids keep a holiday journal, with written entries, every day of your holiday. Have them collect fun pieces of trivia – ticket stubs, photos, brochures – to illustrate, and/or have them do their own drawings to accompany the text. Homework doesn't have to be a task dreaded by either children or parents, as long as you make learning fun. Most kids would rather do something interesting than sit around all summer long feeling bored and disinterested in the world around them, or watching telly for hours on end. Start your children on projects of discovery and they may even find a life-long interest in a specific topic. Remember, they may not be interested in everything you offer, so take the time to find out what excites them most. It's a bit of trial-and-error, but it will be worth it in the long run!